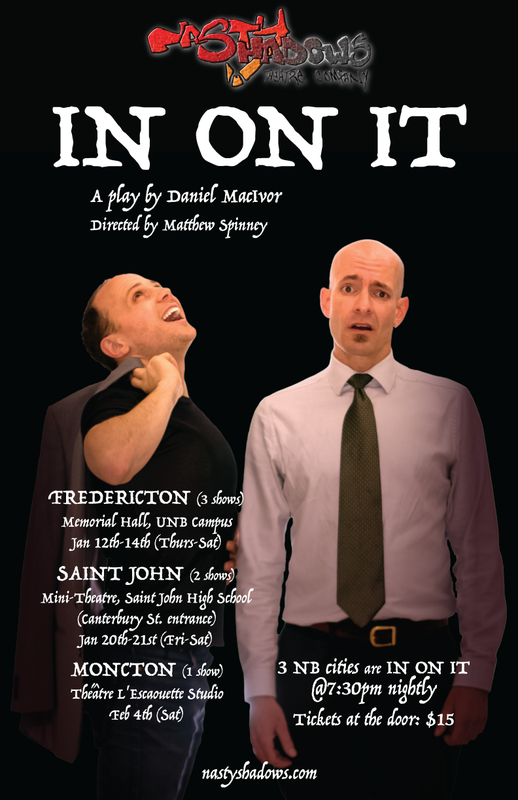 IN ON IT | Nasty Shadows Theatre Co.
That last performance in Moncton may have felt the most, umm, IN ON IT! It just felt right, top to bottom, wonderfully cozy space at Théâtre l’Escaouette, using their rehearsal space as a performance studio. 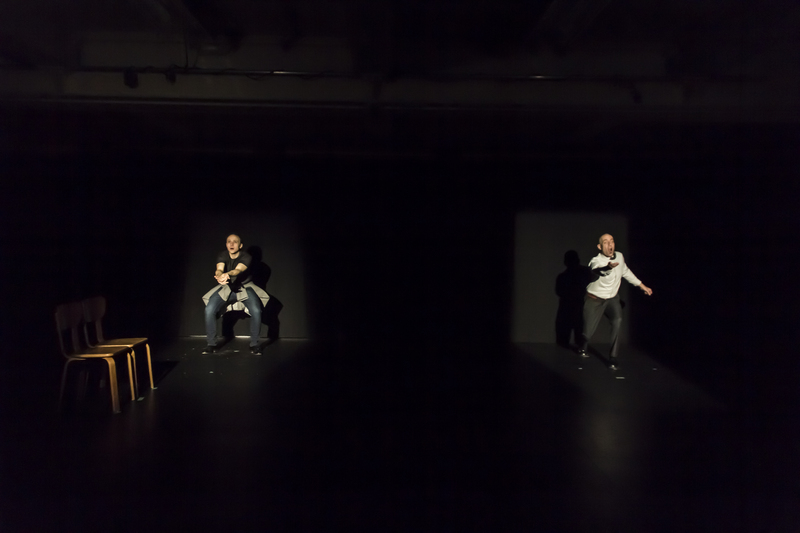 Marc, from l’Escaouette, brought lights down into the space, which is already draped in black and set up with sound. It really was the most perfect venue for the show out of the three spaces we played, because of that intimacy with the audience that we were able to share more in the Moncton space than the rooms in Fredericton and Saint John. Freddy and SJ still had the audience connection, but those raised stages where you are essentially “talking down” to the audience really hurts some of that, and for us part of what we need is to be more on the level with the audience, I think. Being on the same level with the audience in Moncton was a wonderful way to wrap up the run. 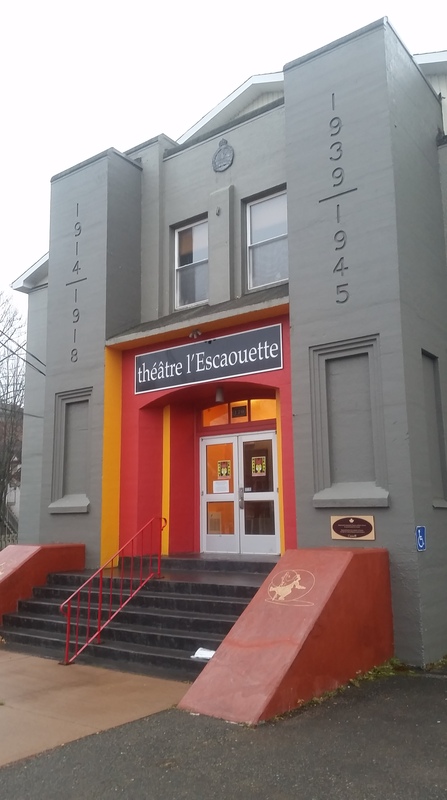 And the people at Théâtre l’Escaouette were outstandingly fantastic from the moment we made the booking to the moment we left the space after the show. Each person we dealt with was just incredibly kind, professional, and encouraging. It was a really great experience playing there, so hopefully Moncton can become a regular stop for us. 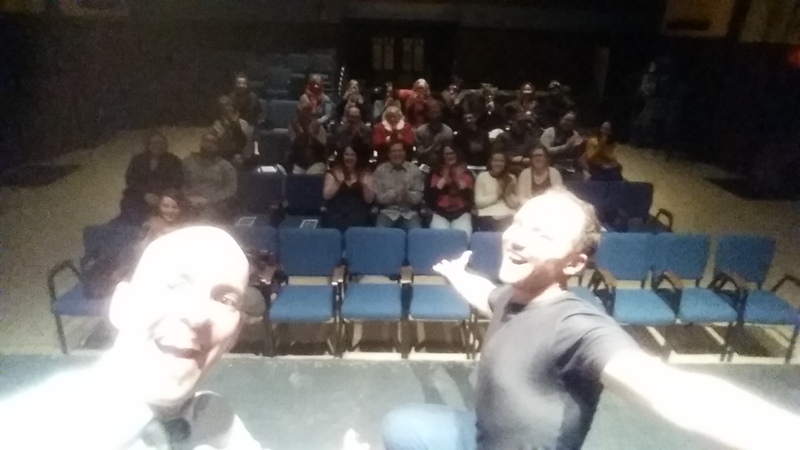 The show in Moncton, as noted above, went very well for us, and the audience was very responsive – always cool to hear the different things different audiences catch and react to, which in turn feeds back to us. That final performance of something, even though we’re hopefully keeping this show in the wings for a future run, but the final show of anything is always bittersweet, and that last night in Moncton was no different. The show itself has already been an emotional ride for me as THIS ONE, with many moments in the show weighing heavy because of their inherent weight, but some because of personal reflection. So, the usual impact of the show on my soul coupled with that being the final performance all added up to an even more intense emotional ride than usual. By the time we hit the final moments of the show, from the crash scene forward, I was having a hard time not bursting into tears on numerous lines. And then the very final moments of the show, listening to that precisely built sound cue by Michael, I was swept up in the weight of the moment. Imaging that crash, the scene, while listening to those sounds … it’s a rush I won’t soon forget. After a brief reprieve, I’m sitting to collect my thoughts … the Saint John run was over in a flash, it seemed. As always, it’s nice to see a few family and friends (thanks for ALWAYS coming! ), and then a few other unknowns … but we can’t seem to generate an audience in Saint John, not that we have a large following here in Capital City, but our numbers are more consistent up here, I think. 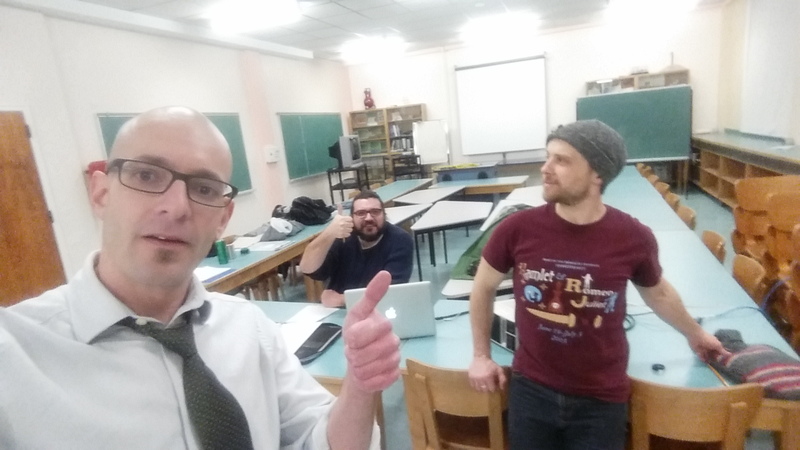 It will be cool to see how we do in Moncton, based on our limited publicity campaign – we really rely on word-of-mouth and the social media posts via the various channels available. Regardless of the size, it’s always a pleasure to play in front of folks, to complete the circle we began with the rehearsal process and have an audience of any size in the room to receive our storytelling. It’s a pleasure and a privilege. Thanks to each of you for coming. MALE ACTOR: I say my second line. OLDER FEMALE ACTOR: I say my second line. MALE ACTOR: I say my third line. OLDER FEMALE ACTOR: I say my third line. MALE ACTOR: I say my fourth line. OLDER FEMALE ACTOR: I say my ninth line. MALE ACTOR: I look at her funny. OLDER FEMALE ACTOR & MALE ACTOR: Focus! MALE ACTOR: I say my sixth line	. OLDER FEMALE ACTOR: I say my fifth line. OLDER FEMALE ACTOR: I say my tenth line. RAY: And then you’re gone. … MacIvor (seemingly) captures the moment of death wish such wonder and precision, yet still oozing a feeling of elusiveness … he does this in HERE LIES HENRY at the very end as well, in a much longer passage … very different, but that feeling is unmistakable: YOU ARE IN ON IT. 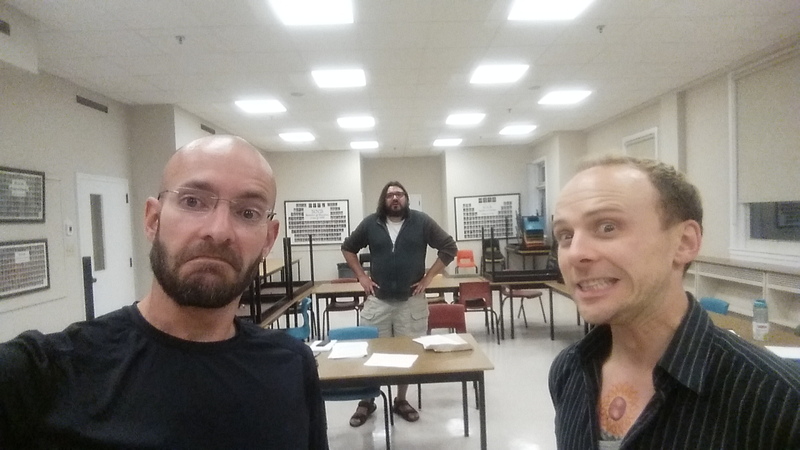 And that’s it for Fredericton … feels weird. But we had solid turn outs each night, and played to about 75 people overall, which is average/high/low for us all at the same time, ya just never know. I had anticipation one of the nights would have seen a larger crowd, as has happened in the past, but alas … and so we’re taking the show on the road! Onwards to SAINT JOHN this coming weekend! In the moments leading to the show finally opening, I was standing in the wings somewhat a nervous-wreck, but completely confident in the adventure before me. It was really weird to not see the faces of the audience – you forget how blinding the stage lights can be until you find your view around them (another symptom of less stage time). The last 2 shows we’ve done in such a way as to use the light in the rooms we used, so I’ve been away from stage light for a while … it felt lonely up there at first, searching for that connection with the audience which the opening monologue so desperately needs, and then I could feel the presence and begin to hear them out there, and finally see them (sorry we didn’t get a shot of you that first night, but the idea didn’t occur to me until after the opening show). 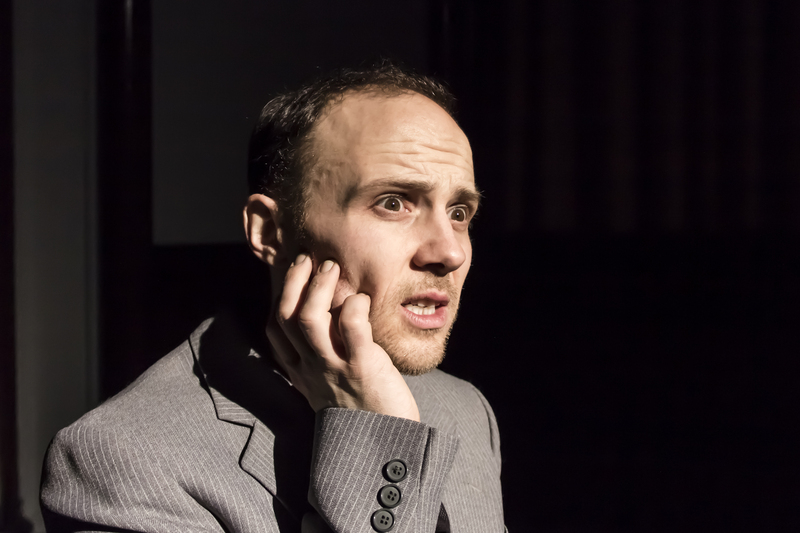 I had thought the preview show earlier in the week had bled out my main bout of nerves, but on this night I had much to shake off at first as I glistened my way through the first couple of scenes (the bald head does little to catch the sweat). 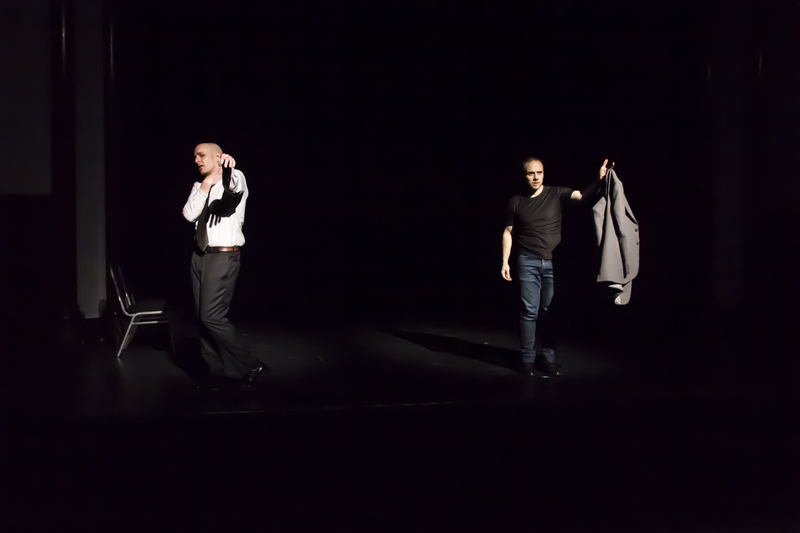 We made it through the show without much of a hitch at all, in fact feeling quite good about what we’d created together, the three of us, using MacIvor’s words. 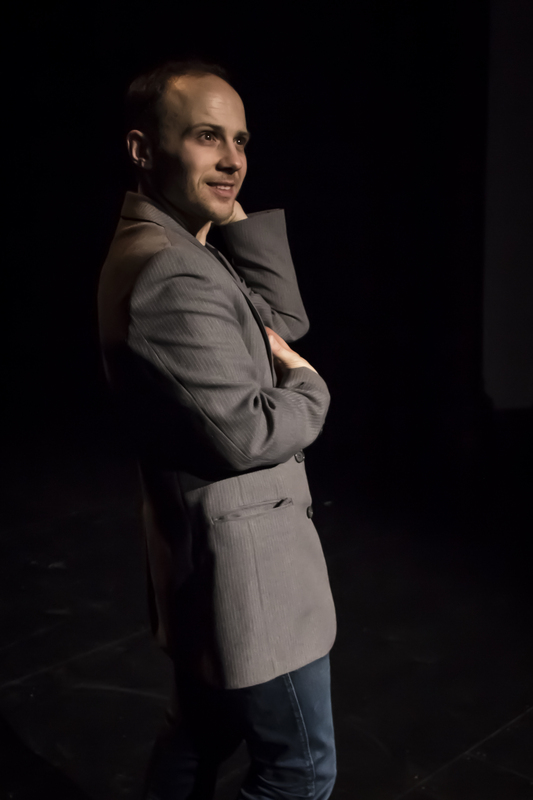 Matt’s direction is what sculpted the overall trajectory and much of each scene’s nuance, and I’m so happy to have shared the stage with Michael in such an intense manner – we really play well off each other, as we’ve experienced in smaller doses in the past, but this show was just the two of us trusting one another and it is feeling really good for the rest of the run. Show week! Opening our “3 CITIES IN NB ARE IN ON IT” tour in Fredericton on Thursday. 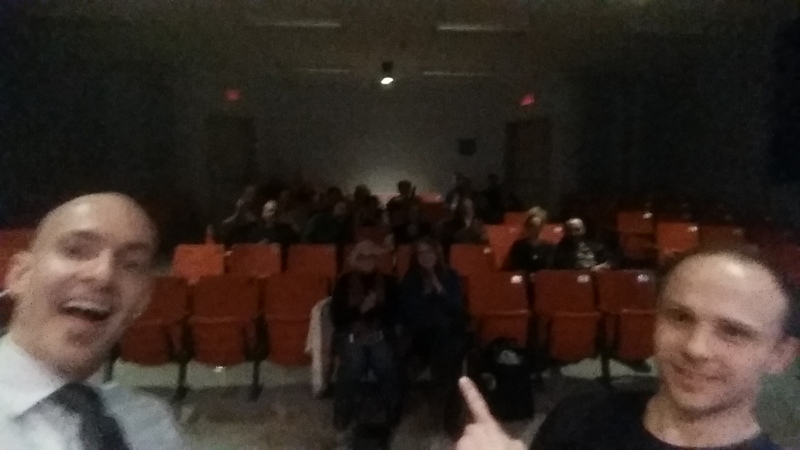 Last night we performed for a small invited preview audience – lessons learned. 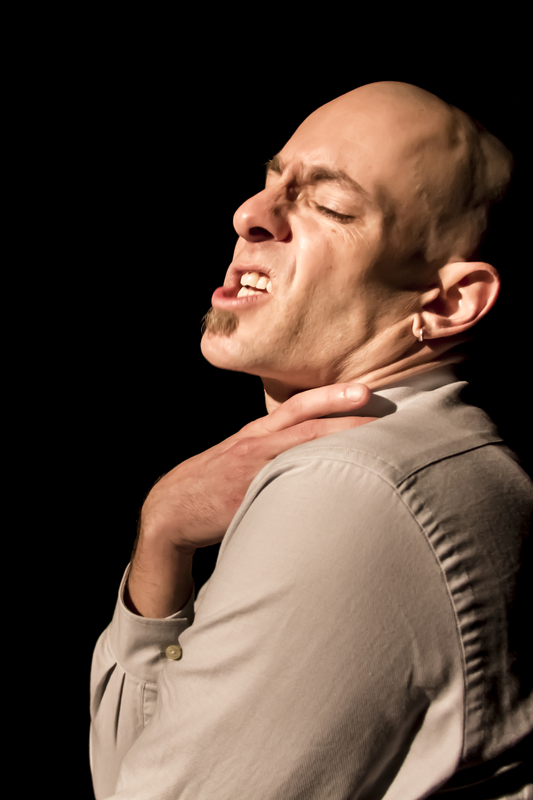 All my life I’ve been a performer in some capacity, at times more active than others, but with our recent shifts in how Nasty Shadows stages things I have found performing only once per year to be both exhilarating and terrifying! We had a small group of friends come for the preview last night, and I was nervous all day … nauseated a bit in the afternoon, sweating buckets at the start of our preview run, but then the groove started settling in and I began to feel the comfort of being on stage in front of watchful eyes – thanks to those who endured the preview! It’s much appreciated! Before breaking for Xmas, Michael and I did one last run of the show together without Matt watching, so just the two of us performing in an empty room. Again, quite a different feeling without any outside investment in our actions, but it was necessary for us to keep the show rolling. Over the break Michael and I met only once to run lines together, while each working lines on our own during the rest of the time (the three of us and our ladies all had a very great evening together relaxing outside of the play’s shadow, so that was great too!). Since we’ve been back we have run the show a number of times, worked some spot rehearsals for certain scenes/moments needing massaging, and have tightened things into a well oiled machine – but there’s this human aspect to it all that keeps it breathing and unpredictable as well. I used to shoot for saying my lines and making movements that were *exactly* the same each time I performed, but over the past few years I’ve gravitated to a more loose approach while still maintaining that foundation. It’s healthy and more fun to see how things change night to night and how you have to react to that development. I’m still locked into a foundational performance, but it allows me to riff off that base a little more … and playing with Michael makes this easy – I think we work well on stage together, listening and responding in kind. Thursday we make this live for an audience in Memorial Hall … tonight we run again in our rehearsal room, and tomorrow night we move into the Hall for a speedy set-up of our technical components – there are LOTS of sound and lighting effects in this show, so tomorrow night is going to be a long haul … but it will teach us what we need to know for moving into the venues in Saint John and Moncton where we’ll have even less set-up time … an exciting week, and it’s hard to believe we’ve finally reached this point … here we go! 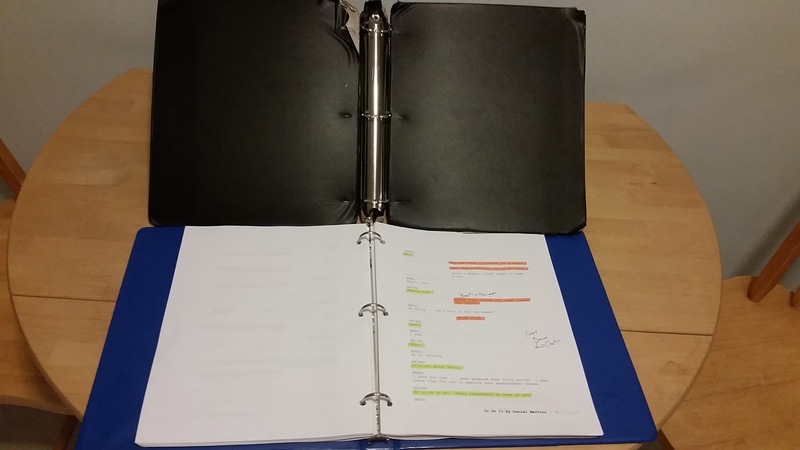 Our first FULL run of the play = in the bag. I’m really hoping the audience loves this play as much as we do, and so for their sakes our execution must be precise – like the text itself, there really is no room for error. And yet, I see more and more of the big heart the show has and how much it’s affecting me. I am hoping the show draws in the audience to its world the way this process has taken me into that world. As always, many lessons learned tonight after getting through the entire play for the first time. 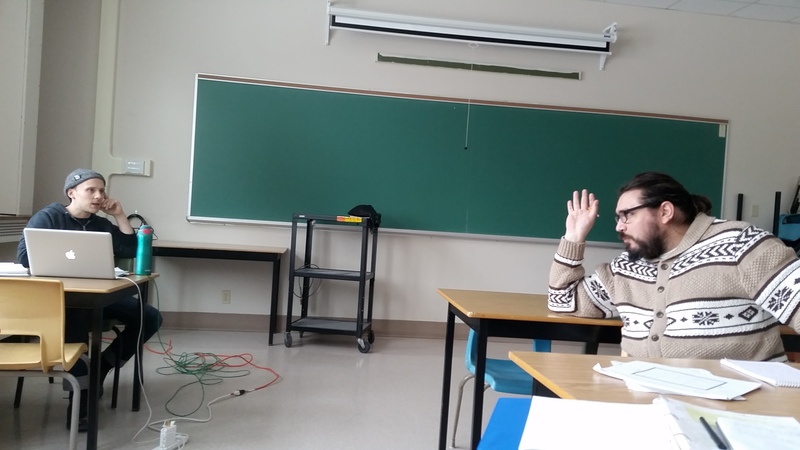 Showed us where pacing lags, memories fade for lines and/or scene transitions, etc. The story/ies is/are not told in a linear way – we move from SHOW state > PAST state > PLAY state all the time, and not necessarily in that order, and sometimes even those lines are blurred. Damn, I can’t believe how incredibly all of this ties together. 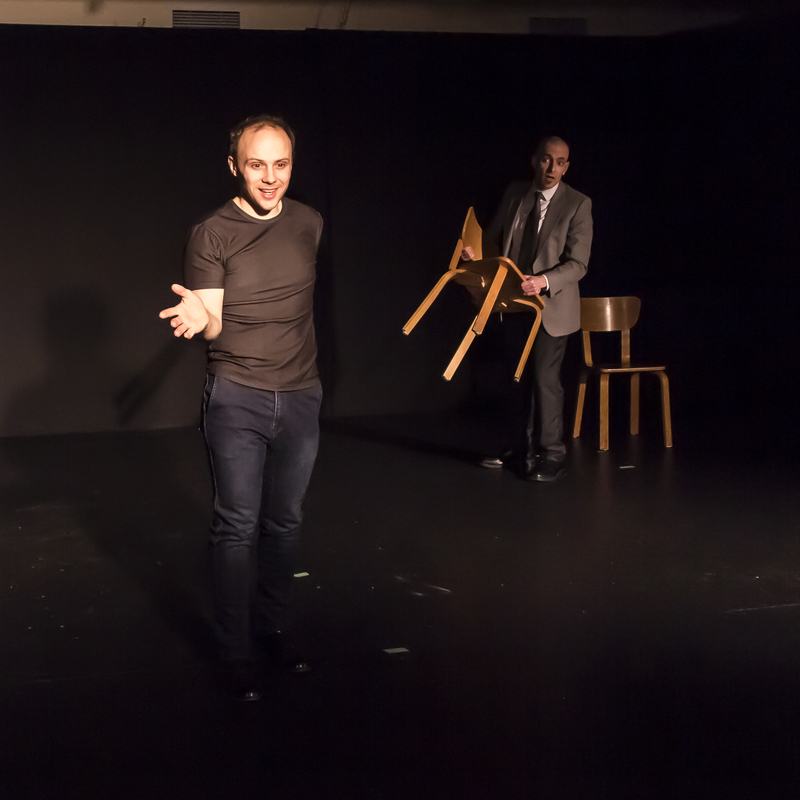 It’s the epitome of the well-made-play – and for me it’s the play’s awareness of itself that raises it to this other level, and not in cheap or gimmicky ways, but rather the entire world of the play hinges on it being a play, that the audience be there with the live actors, and that everyone is aware of attending a “play”. This One’s journey/gift is the play, in every sense of the word/idea/moment. We made excellent strides over this past week resulting in the end of our refined/detailed work on the final scenes of the play. It’s been an interesting week with some of the text beginning to hit me a little more intensely – I found myself crying while trying to run lines by myself, or trying to recite lines for Alicia during a drive the other day. Then the other night in rehearsal we did further work on the “old man” scene I was talking about in my last note, only this time the weight of the moment and the personal thoughts that flash through my mind during that moment, all added up me finding a really great space for the scene with tears welling up … now to hold onto that and craft it into something I can return to. The day ended with just me and Spinney working my final monologue of the show, the closing moments of the play. It’s going to be quite a journey coming from the start, through the play, and hitting this monologue at the end of it all … I can’t wait to run that, and run that, and run that! And so, we are now ready to run the show a few times this coming week before we take a short Xmas break. REALLY looking forward to finally running this entire show … I mean, play … tomorrow night will be our first pass from top-to-bottom, and it’s both a scary and fun intersection of the process. Last week we did a run of the first half which went, well, as well as could be expected for the first big run of a section of the show but was a great learning part of the process and gives you a more cohesive feel for what we’ve stitched together. I can’t wait until we reach the end of the show’s scene work and start running larger stretches and refining moments, etc., and then simply running the show as a whole – looking forward to that feeling. This is such a beautifully crafted story of love, I am so happy to finally share this MacIvor gem with our Nasty audiences. We had a good session Wednesday night with This One and That One in their native forms, so this was a scene in real-time as the characters/actors who are performing the play – “It’s complex”, to steal a line from the play. There are three “realities” the play inhabits as it tells this story of love and friendship. Tonight’s scene was in “Show” reality, so the actors themselves. When we transition back in time to a scene happening between This One and That One we are in a “Past” reality, and when the This One and That One become other characters that is the “Play” reality. These realities or “states” bounce around and gradually weave more, blurring their lines. Damn, this is an incredible text. This was the first big scene between the characters as themselves, so our first big moment of exploration as to how these guys might interact, which in turn will bleed backwards into the work we’ve already done, but this will also be the first point the audience gets a more exposed look at This One and That One and their relationship. The previous “Show” scenes were quick and behaved more as joiners between other scenes, but this time we spend a few pages in “Show” state. It was good to feel that interaction so as not to lose sight of the overarching story at work between This One and That One. Friday was a solo session with where Matt and I worked on refining my opening monologue after some earlier work we had done. It’s good to be able to be honest and constructive with each other. For instance, there was a certain gesture Matt had asked for in our last session that I wasn’t overly crazy about but wanted to give him the benefit of the doubt – glad I did. I’m now a fan of the moment and find it to be exactly what we need to complete that picture. That opening speech changed so much from the clinical detached approach I brought into our first rehearsal for it. It will become a hard moment for me, I think, and hopefully an engaging start to the show if we hit just the right note – there’s a balance to be had here between being over emotional/sentimental and so leaning into the world of cheese, being cheesy, but on the other side of that is a feeling that can hit us all to our core. I can feel it reading the text, and we’re trying to bring that out in our performances – I don’t want to get in the way of the text because it’s the draw here. And then today (yesterday now, I guess) all three of us were back together for some group work, finishing out the scene between This One and That One from the other night and the following scene from the imaginary Ray story, resulting in us running scenes 1-7 – the first 28min or so of the show. It felt good! Not “good” like I wanna show anyone, but “good” to have accomplished that much and put it together. Gives us all a different sense of where we are and where we’re going and what we need to do. We have LOTS to do! Michael and I met on Saturday and roughed out a draft of sound design taking us from pre-show to scene #5 — this is basically the part of the play we’ve refined through further work at this point. So it might be fun to use some of the sounds during rehearsal. It’s only preliminary work we’re preparing for Spinney’s input/critique/approval, but chipping away at it gradually now, rather than later, will be very helpful in numerous ways. We really are just the 3 of us covering all aspects of production, so managing our time is essential – and one of those ways is by inviting help when we do need it and can get that help, so we’re luckily having Diane Cole in to help us with some dance choreography the show requires at one point. Having Diane work that out and work with us is going to be immensely helpful. Tonight I met Matt by myself for an hour or so and we worked the opening speech of the show. GOOD SESSION! I really love the way Matt pulls things through the play. This opening always seemed cold and clinical to me when reading, and it always grabbed me that way. We went in a completely different direction tonight and I am now seeing this speech more clearly, seeing This One more clearly, and I’m just waking up to how difficult this part will be to pull off effectively. 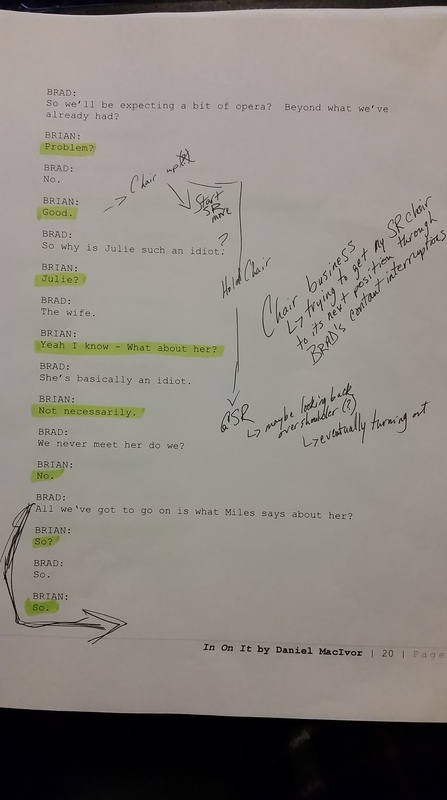 I’m also at the point where that Mamet-ian notion begins to take effect where “all these feelings are engendered by the script”, by which I mean I’m starting to meld my own personal character with that of This One, the main part I play – we both have numerous “characters”. I start to see myself in the role and begin to feel weird emotional connections and reactions in the room, but upon reflection it’s mostly made up and just the play playing through my head … right? This show is so tight, in every way, and we need to be the same in performance and production execution … we have our work cut out for us over the next 2 months. It’s been a slow burn up to this point in the process – due mostly to my unreliably migrained head. However, in the last couple weeks we have made HUGE strides which I credit to our fine director, Mr. Spinney. 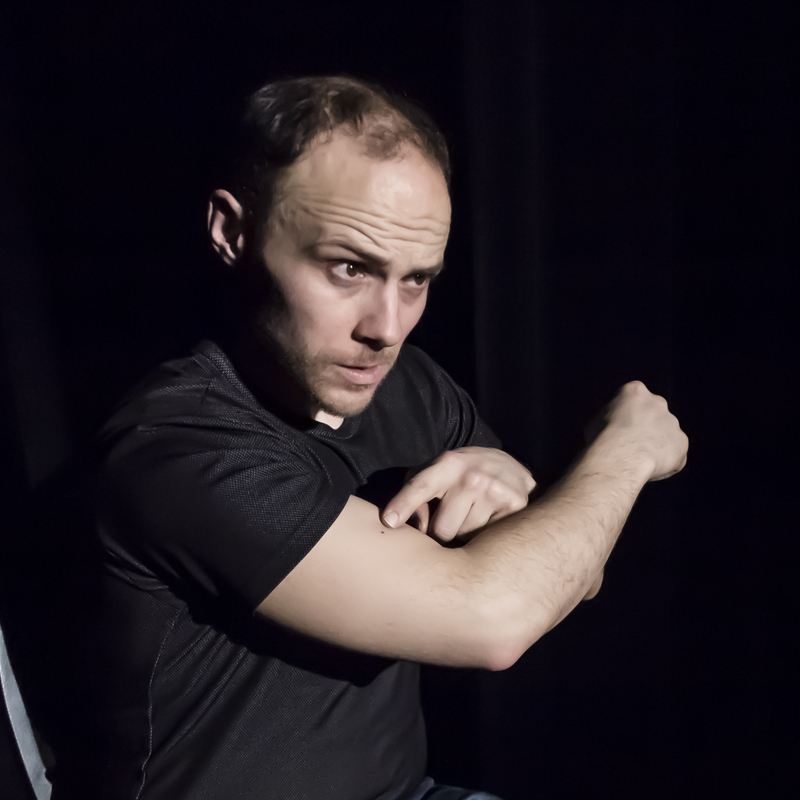 Matt is carving out a process I am thoroughly enjoying and we have the time to play – and this is what Matt’s pushing, the playful nature in the rehearsal room which gets lost a bit when you are under the gun of time. We have burned away some time (see my head note above), but we are still in a very good spot. 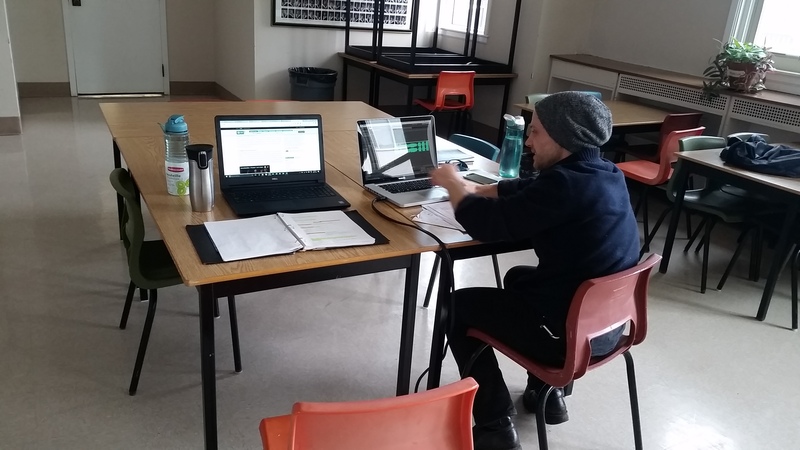 Our first month together was spent doing rough outlines of each scene, reading together, walking through general blocking, and some minor playing inside that framework. End scene, move on. 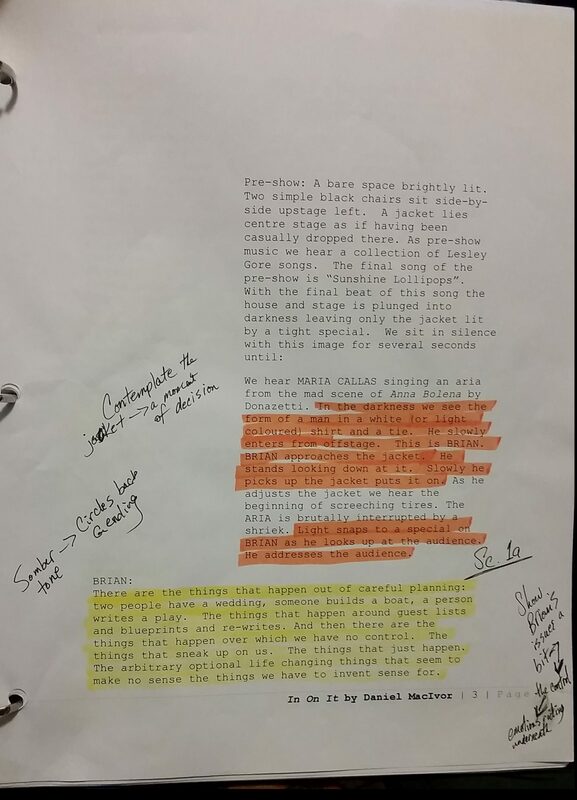 It went smoothly gave us the perfect sense of the whole that we needed to go back to the top of the show and start our first pass under a closer look at things, sans scripts – ooh, I love this part of the process!!! The lines are there in our head, some more shaky than others, but Michael and I are meeting to help smooth out those bumps, so then we get up on the floor with Matt tossing out brilliant ideas and insights – when we decided on this play I was feeling a little “ummph” about not having Matt on stage because he is SO STRONG ON STAGE, but he is a wizard at the table in the director’s seat. 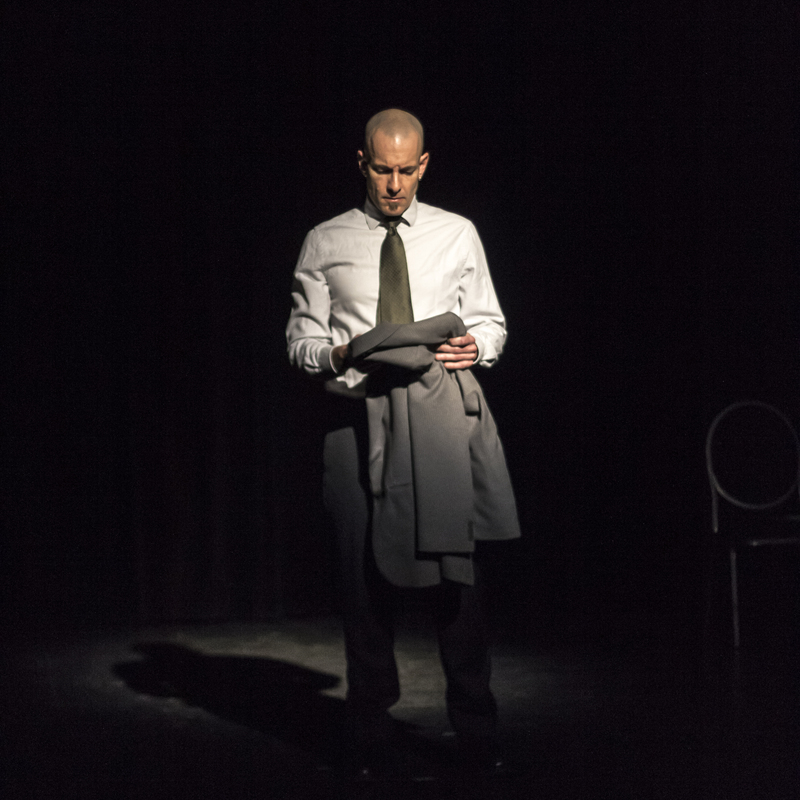 This is my 2nd time with Matt at the helm, the last being a one-man MacIvor show, so we’ve always had strong texts to work with, but Matt pulls stuff out and sees things in very perceptive ways. I’m super glad to have him steering our ship. He’s IN ON IT. So tonight (last night?) we worked a scene between a father, Ray, and son, Miles. They are having dinner together but they don’t communicate well, which makes this scene worse because important news is being shared. 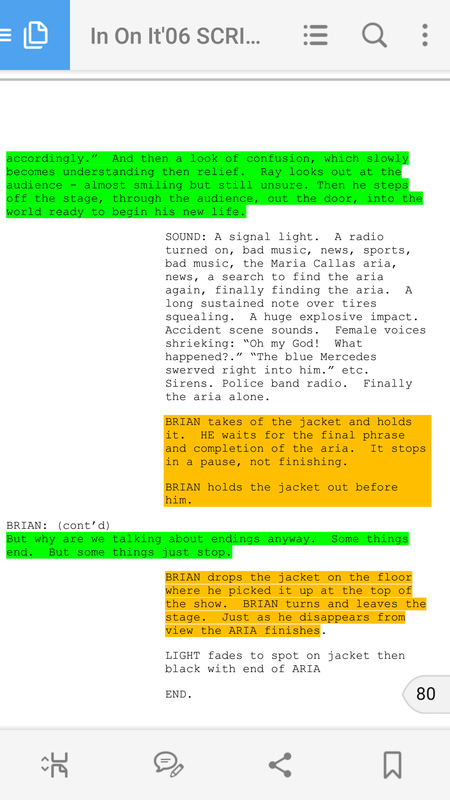 When we got to the end Spinney noted how from the beginning of the scene Miles is driving at avoiding Ray which leads/builds over the scene to the insertion of Brenda, Miles’ mother, Ray’s wife, as the usual buffer between the two – Brenda is only mentioned in the scene, not actually in it, and Matt’s insight into Miles’ problem from the top being that she’s absent was just an example of the great stuff this guy is pulling from the text … seems almost obvious now, but … it wasn’t for Michael and I because we’re just focused on other stuff. So good to have a director who is an actor. In On It. We are now. You will be soon. 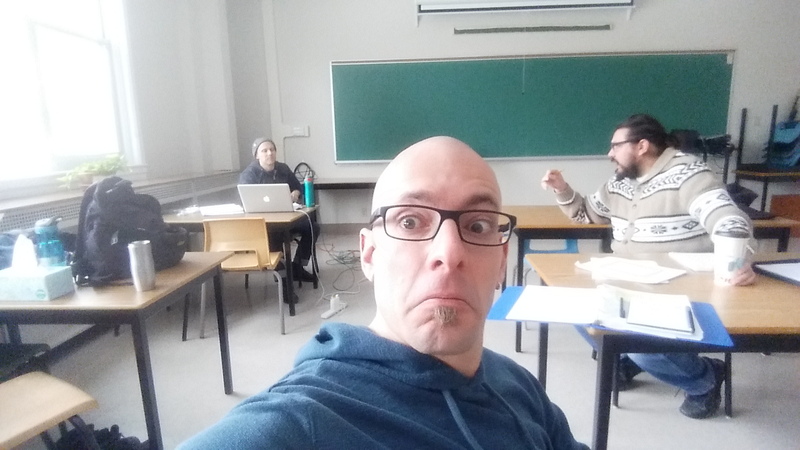 Theatrically invigorated by our first rehearsal of the process, post-read-through. Good to be the rehearsal room again. Excellent to be playing off Michael’s energy and passion one-on-one; feeling securely inspired under Matthew’s directorial eye; a wonderful feeling to be within the craft of MacIvor’s text; thrilled to see where we take this, together.